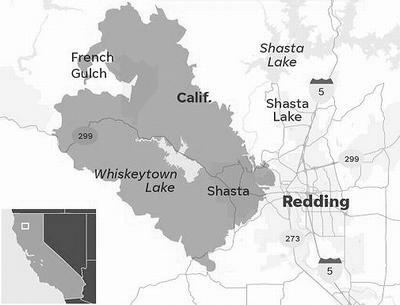 REDDING, California, August 5, 2018 (ENS) – The Carr Fire, one of the most destructive wildfires in California history, has claimed another life – bringing the death toll since July 23 to seven. A Pacific Gas and Electric crew member was doing restoration work in Shasta County Saturday afternoon when the fatal accident occurred. The PG&E crew member died while doing restoration work near the blaze burning in “dangerous terrain” outside of Redding, J.D. Guidi, a utility spokesman, said Sunday. Company officials identified the worker as Jairus Ayeta, 21, an apprentice lineman. Since the fire was started July 23 by mechanical failure of a vehicle, six others – two firefighters, and four residents – have died as a result of the blaze. 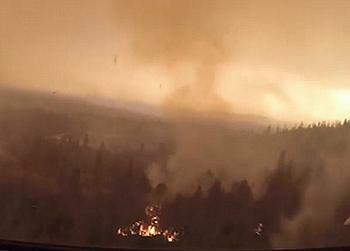 The fire now has spread to 154,524 acres and destroyed 1,080 residences and 24 commercial structures. 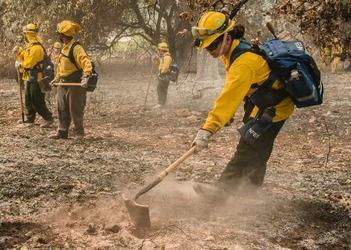 Steep drainages, winds, and dry fuels hampered firefighting efforts overnight. Hot, dry, and unstable conditions are expected for today. Firefighting air tankers from throughout the state of California are flying fire suppression missions as conditions allow. 4,674 fire personnel are working to control the Carr Fire, which is now 41 percent contained. Shasta County Sheriff Tom Bosenko has been allowing evacuated residents back into their homes since August 3, as long as they remain vigilant and obey all official instructions. Residents of some areas are being required to produce documentation to verify residency. Some roads are being reopened, but mandatory evacuations persist and other roads are still closed. Click here to learn which roads are open and which areas are open to repopulation by evacuees. President Donald Trump has approved a major disaster declaration for California. The declaration will help fire victims with unemployment assistance, food aid and legal and mental health counseling, as well as other federal programs. Recreation in the area will not be the same as before the fire anytime soon. Scorched by the fire, Whiskeytown National Recreation Area, which last year drew more than 832,000 visitors, who spent over $35 million in nearby communities, is closed for the summer and likely longer. Large parts of the Sacramento River Trail are closed where four bridges burned in the western section. The city is asking people to stay away from that six-mile section until it’s safe. Cal Fire reports that as of Sunday morning 18 large wildfires were burning in the state, charring an estimated 873 square miles of land. Many of them have been burning for days and some for weeks. 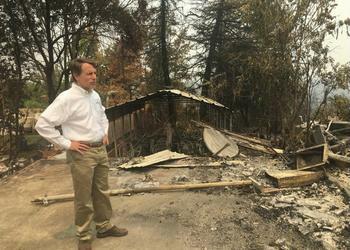 The Federal Emergency Management Agency, FEMA, announced today that federal disaster assistance has been made available to the state of California to supplement state, tribal and local recovery efforts in the areas affected by wildfires and highs winds from July 23 and continuing. Federal funding is available to affected people in Shasta County. Assistance can include grants for temporary housing and home repairs, low-cost loans to cover uninsured property losses, and other programs to help individuals and business owners recover from the effects of the disaster. Federal funding is also available to the state, tribal and local governments and certain nonprofit organizations on a cost-sharing basis for emergency work and the repair or replacement of facilities damaged by wildfires and high winds in Shasta County. William Roche has been named as the coordinating officer for federal recovery operations in the affected area. Individuals and business owners who sustained losses in the designated area can begin applying for assistance tomorrow by registering online at www.DisasterAssistance.gov or by calling 1-800-621-FEMA (3362). In response to the devastating fires, Tri Counties Bank has created a GoFundMe campaign to help people affected. Click here if you would like contribute.